Gozio partners are acute care, specialty care, university, and children’s hospital systems that each require a unique set of needs outside of wayfinding. 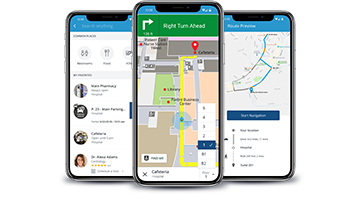 Gozio works with each hospital and healthcare system to ensure delivery of a feature-rich, mobile wayfinding platform specifically designed in collaboration with our partners to provide excellence in patient experience. Children’s Healthcare of Atlanta has a patient population of more than 368,000 and includes three hospitals, the Marcus Autism Center, 22 Sibley Heart Cardiology offices and 27 neighborhood locations. Piedmont Healthcare is a $3.5 billion integrated healthcare system of seven hospitals and close to 100 physician and specialist offices across greater Atlanta and North Georgia. UHealth’s comprehensive network includes three hospitals and more than 30 outpatient facilities in Florida’s Miami-Dade, Broward, Palm Beach, and Collier counties, with more than 1,200 physicians and scientists. The Lennar Foundation Medical Center is a 200,000-square- foot ambulatory care center on the University of Miami’s (UM) Coral Gables campus that provides easy healthcare access to leading physicians for students, faculty, staff and surrounding communities. The new $300 million HSHS St. Elizabeth’s Hospital and Health Center in O’Fallon, Illinois opened on November 4, 2017 as the most technologically advanced medical center in the region. At Emory’s Midtown hospital, some of the world’s top specialists are advancing medicine every day with more than 1,200 Emory Clinic and 440 private practice physicians spanning 28 specialties. For more than 125 years, Grady Health System has been the cornerstone of healthcare in the Atlanta region. Grady Health System is home to The Marcus Trauma Center, an American College of Surgeons designated Level 1 trauma center which meets the highest standard of excellence for trauma care. Prisma Health is the largest not-for-profit health organization in South Carolina, serving more than 1.2 million patients annually. Serving the community since 1961, WakeMed Health & Hospitals is a nationally recognized, private, not-for-profit health care organization founded and based in Raleigh, N.C. The largest health system in Wake County, the 941-bed system comprises a network of facilities throughout the Triangle area. New Hanover Regional Medical Center is the largest healthcare provider in southeastern North Carolina, and a quality-driven network of hospitals, outpatient centers, emergency services and physicians. UNC Medical Center is a public academic medical center provides patient care, educates health care professionals and advances medical research in partnership with the UNC School of Medicine. With more than 900 beds, the medical center in Chapel Hill comprises four hospitals and the additional UNC Hospitals Hillsborough Campus. Serving a 17-county region in North Florida and South Georgia, Tallahassee Memorial HealthCare (TMH) is comprised of a 772-bed acute care hospital, a psychiatric hospital, multiple specialty care centers, three residency programs, 32 affiliated physician practices. Serving the community since 1961, WakeMed Health &amp; Hospitals is a nationally recognized, private, not-for-profit health care organization founded and based in Raleigh, N.C. The largest health system in Wake County, the 941-bed system comprises a network of facilities throughout the Triangle area. Gozio Health wins MedTech Breakthrough Award for Best Patient Engagement Platform. Gozio was recognized with a 2016 Digital Health Award Honoring the World’s Best Digital Health Resources. Gozio is excited to partner with Georgia Hospital Association (GHA) as a Georgia Hospital Health Services Digital Health Product Line Partner. Gozio is a signature member of the Advanced Technology Development Center (ATDC), one of the nation’s premier high-tech, start-up incubators, located at the Georgia Institute of Technology.